We supply a great range of Batteries, ranging from Li-Po, Button Batteries and AA / AAA Types. Our are used in Airsoft sights and torches.We stock high quality batteries like VP Racing,and you will get the best. Airsoft electric guns use powerful batteries to run and it is important to pick the correct battery for your gun.The question is what battery does your gun need and what do you need to look out for.? Here is a small summery of what to look out for. This is the terminals that connects the battery to the gun. It is important to find out what connections you have on your guns so you can connect the battery. 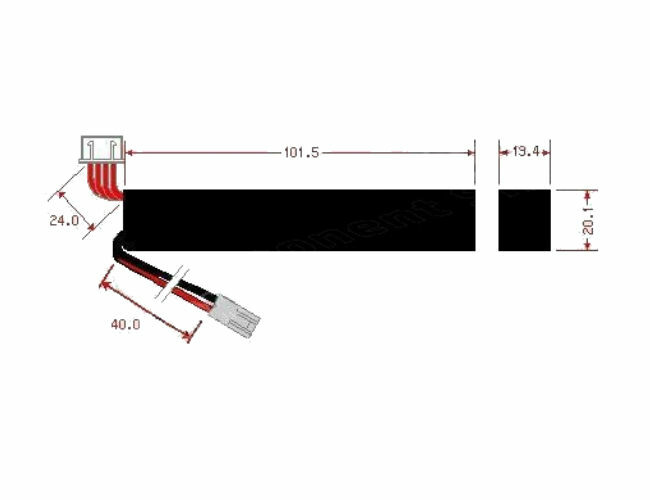 The mini tamiya is the most common type of connector and usually comes with the battery and most guns. ;Not to be confused with the older standard tamiya which is larger and as space is at a premium less popular. Deans connectors are usually on standard guns but lots of players convert the terminals to deans. They are liked because the give a good connection and therefore a better flow of electricity. It is not difficult to change the connector if you have the need to. A basic knowledge of soldering and a connector and you are in business. Now a word about Voltage. 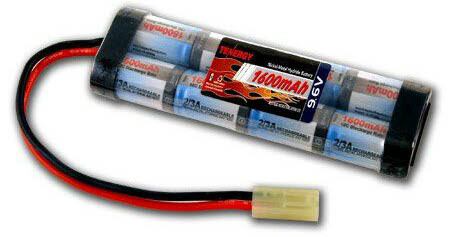 Airsoft batteries are in ranges of different volts, from 7.2v up to 12.8v. but the most common is from 7.2 to 9.6 volts. Voltage is the push that moves the charge along the wire. Higher voltage will give you better performance.A higher voltage will give better push and flow to the guns motor.greater flow of electrical current to the motor.Please be careful and do not pick a higher voltage battery that may not be compatible for the gun you have.High voltage can cause the triggers to burn out if not designed for the voltage. MaH is Milli Amp Hours. This rating will determine on how long it will run the gun. With experience you can find out how long a battery will las in your gun so you can carry spares. it is alway advisable to carry a few spares as 3 batteries should last all day. It is safe to say LiPo Batteries are the batteries most in use now but they are a little problematic and can catch fire is it is shorted out ( that is if the positive + comes into contact with the negative - without anything in between to use the power. Care is also required when charging so make sure the proper charging using it used. If they are allowed to run down completely too fast they can be ruined and will not recharge. They are popular because they are small and have a lot of power. Make sure you stop firing before the battery when the power starts to decrease. Do not let it run down completely as this will damage the battery. It is always best not to leave batteries on charge without keeping an eye on them. The are temperamental at times and need to be watched so you can act quickly if there is an incident. Batteries can bulge out and they should be checked to make sure there is no swelling.If there is swelling then do not charge the battery. The battery has had its day. Make sure you use a good charger to re-charge the batteries and charge at a place that is not likely to catch fire.